As promised, it is time for another dose of Rainbows! If you missed last weeks post, I am currently suffering from an obsession with Rainbows. To utilise this obsession productively I have been creating a series of Fun Rainbow Plays to share with you all. 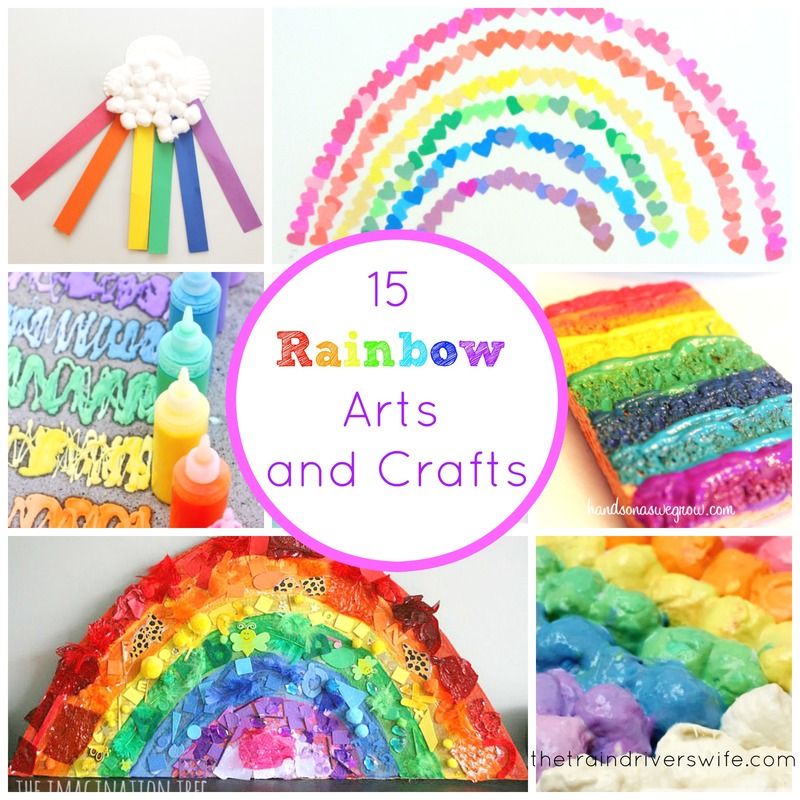 This week, I bring you the best Rainbow Arts and Crafts from around the Web from some seriously creative bloggers! So sit back, enjoy and hopefully you will feel as inspired by these ideas as I do right now! Why not create this fun Sensory Rainbow Art from Fun at Home with Kids. This simple Paper Plate Rainbow Craft from Housing a Forest is sure to brighten up any window! Get creative with this Pipe Cleaner Rainbow activity from Still Playing School. This Toddler Big Art Rainbow from Twodaloo looks like amazingly messy fun for little ones! Why not practice fine motor skills and artistic skills with this Rainbow Chalk Paint from You Clever Monkey. You can even let the kids hammer it themselves! Or turn snack time into a Rainbow with this Rainbow Toast from Teach Preschool. Even the pickiest eaters will love this! This Vibrant Black Glue and Salt Rainbow from Mess for Less looks fantastic and is simple too! I love this Rainbow Handprint Craft from B-Inspired Mama. Even the littlest mess makers could get involved with this. This Giant Rainbow Collage from the Imagination Tree is simply stunning and will use up all of your leftover scrap materials too. This simple Rainbow Sponge Painting from Hands On as We Grow is sure to occupy kids for hours. Bring your Rainbow inside with this beautiful Rainbow Wall From No time for Flashcards. This fun Rainbow Fruit O’s Craft from Hands on as We Grow looks amazing and you can even munch on the leftovers. I love this Baked Cotton Wool Rainbow from Learn Play Imagine. The colours look amazing! Or, why not use leftover crafting materials to make this beautiful Rainbow Collage from Happy Hooligans. I love all of these activities and have added most of them to our to do list! I hope you have enjoyed them as much as I have. If you haven’t quite had your fill of Rainbows yet (let’s face it, there are never enough Rainbows) then why not check out these Rainbow Activities too? Thanks again for visiting and make sure you come back next week for our Rainbow Dough and Slime Round Up! Remember, you don’t have to miss a single post. You can follow me on Facebook using the link at the top left of this page, or subscribe to receive email updates. See you soon.